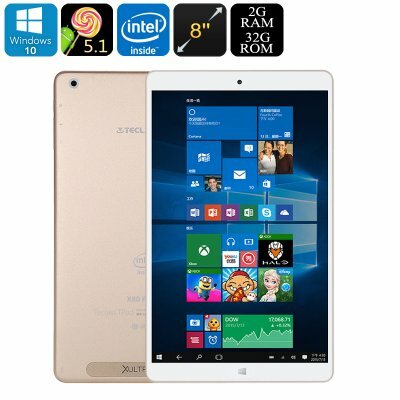 Successfully Added Teclast X80 Power Dual-OS Tablet PC - Windows 10, Android 5.1, Quad-Core CPU, Google Play, HDMI Out, 2GB RAM, 8-Inch FHD Display to your Shopping Cart. As its name suggests, the Teclast X80 Power is a powerful tablet PC that packs some sophisticated hardware through which it lets you enjoy the latest mobile applications, games, and videos without dropping a frame. Being a Dual-OS tablet computer, it features both a Windows 10 and Android operating system – making it the perfect tablet for everybody out there who can not make up its mind on whether to purchase a Windows or Android tablet. With its stunning 8-Inch Full-HD IPS display that portraits all media in breathtaking 1920x1200p resolution, this tablet PC is guaranteed to deliver stunning detail and vivid color – truly taking your mobile entertainment experience to the next level. Holding the Intel Atom X5-Z800 processor, this Dual-OS tablet packs some serious power. Built for speed, efficiency, and energy saving performance – this Quad-Core CPU lets you engage in the latest and most demanding of mobile applications. Added to its powerful CPU, the Teclast X80 Power features 2GB of RAM that provides you with great multitasking opportunities. Play demanding games online, watch movies, or use several applications simultaneously – no matter what you throw at this 8-Inch Tablet PC, nothing will slow it down. With its 3800mAh battery, this Dual-OS tablet lets you enjoy all the amazing features it has to offer for numerous hours in a row before even needing to think about recharging your device – allowing you to get through the most demanding of media filled days. With Google Play installed you’ll have access to an unlimited pool of the latest mobile applications and tablet games that can be conveniently downloaded and installed onto your tablet computer. Its ultra-fast Wi-Fi connectivity furthermore lets you stream online movies and browse the web at lightning speeds. With 32GB of internal memory and the added possibility to insert a 128GB TF card, the Teclast X80 Power tablet PC is guaranteed to hold enough storage for all your files and media alike. The next time you head out on a holiday and have to spend numerous hours in the back of a car or airplane you’ll no longer have to feel bored as, with this Dual-OS tablet at your side, you’ll always be able to enjoy countless hours of mobile fun and entertainment on the go. To increase your user experience even further, this Chinese tablet PC features a micro HDMI cable through which it allows you to connect it to your big screen TV. From now on you’ll be able to enjoy all the amazing features the Teclast X80 Power has to offer in stunning detail on a large screen – truly allowing you to take the most out of your television and tablet alike. Perfect for entertainment, study, and business – this 8-Inch tablet computer will support you in meeting all your needs and demands. The Teclast X80 Power tablet PC comes with a 12 months warranty, brought to you by the leader in electronic devices as well as wholesale electronic gadgets..